There had been various estimates on SBNs tendered in certain sections. 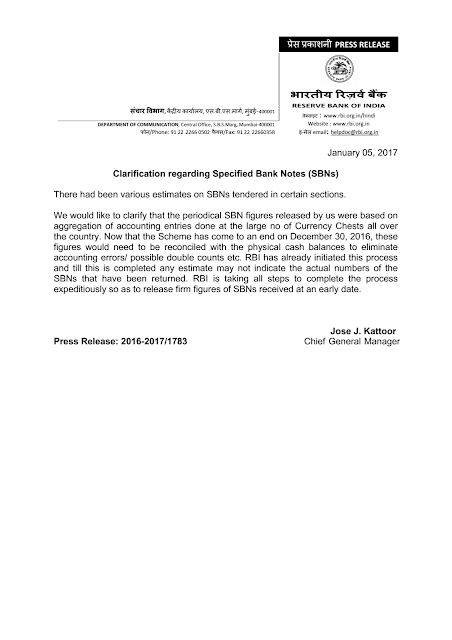 We would like to clarify that the periodical SBN figures released by us were based on aggregation of accounting entries done at the large no of Currency Chests all over the country. Now that the Scheme has come to an end on December 30, 2016, these figures would need to be reconciled with the physical cash balances to eliminate accounting errors/ possible double counts etc. RBI has already initiated this process and till this is completed any estimate may not indicate the actual numbers of the SBNs that have been returned. RBI is taking all steps to complete the process expeditiously so as to release firm figures of SBNs received at an early date.